NTD 2018 is SOLD OUT! Last year we had these awesome badges for everyone to download add to their blog posts or webpages etc. This year is no different! Get your attendee badge here. We have managed to sort out the tutorials for NTD2018 and with that we also announce the registration for the event OPEN! Prices for NTD 2018 are now up. There are only 150 Early bird tickets available so be quick to book yours! We hope to open registration this month already! Call For Papers is Here! You have not missed it! 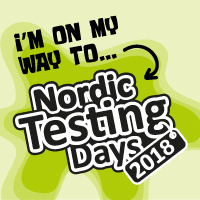 Call for Papers for Nordic Testing Days 2019 is now Open. We are welcoming all your suggestions and ideas for a track, workshop or a tutorial so make sure your proposal makes it before the deadline arrives on the 18th of November. To submit just click the red button above that says: Call for Papers! Read more about Call For Papers is Here! Read more about NTD 2018 is SOLD OUT! Read more about Want an NTD Badge? The schedule is due in the begiining of January so be patient. Also, please note that there are only 150 Early Bird tickets available this year so be quick to book your place! Read more about Registration is now OPEN!